Ballinskelligs Bay is located on the Iveragh Peninsula in Co Kerry, Ireland. The Bay was the scene of two tragic events which occurred in 1916 causing the deaths of nine people. The people who lost their lives were remembered in 2016 with the erection of a monument in the town of Waterville by Heritage Iveragh. On August 13th 1916 four local men: Dennis McGillicuddy, Thomas Curran, James O’Connor and Michael O’Shea were bringing a boat from Rinneens to Waterville. The sea was rough during the crossing. At about 3pm the boat capsized resulting in the drowning of the four men. In November 1916 the Danish Schooner Eliezer was enroute from Canada to Limerick with a cargo of timber. The schooner was shipwrecked in Ballinskelligs Bay. The five crewmen of the Eliezer Anders Nileson, Albert Hansen, Hans Thompson, Hans Lund and Sophus Bastrup were drowned. The monument to the men who lost their lives is situated on the Waterville promenade. It was unveiled in the presence of local representatives, and representatives from Denmark and Canada. A helicopter from the Marine Rescue Services flew over the scene during the unveiling. The lifeboat service was present in Ballinskelligs Bay. 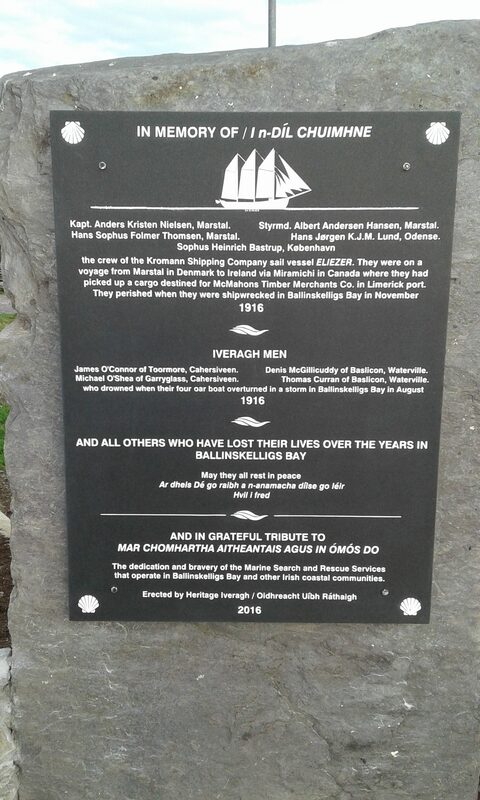 A monument dedicated to those who lost their lives in Ballinskelligs Bay and people who risk their lives to assist others at sea was unveiled in Waterville, Co Kerry, Ireland, in the year 2016 On This Day. Photo: Courtesy of Paddy McGillicuddy grandson of Denis McGillicuddy.